We have a wide selection of brand new Roman Vestments available, with either traditional braid to outline the panels or in a wide range of machine or hand embroidered designs. Complete five piece Low Mass Sets of Roman Vestments start at �0 including VAT (US$645). Many Roman Vestments are held in stock, whilst others are made to order. 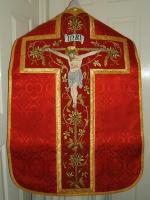 We can also make Roman Vestments to order to many other designs of your choosing. RL001. Gold or Silver wavy bullion braid. White, Green, Purple, Red, Rose, Black. �5 (US$695) RL252. Crucifixion (Machine embroidered). White, Green, Purple, Red. �5 (US$810) RL503. Crucifixion (Hand embroidered). White, Green, Purple, Red. RL002. Gold straight bullion braid. White, Green, Purple, Red, Rose, Black. �5 (US$695) RL256. White Floral (Machine embroidered) RL504.Italian style. All liturgical colours. RL004. Quality Damask braided. White, Gold, Green, Purple, Red, Rose, Black. from �0 (US$995) RL257. Crucifixion & Saints. White, Green, Purple, Red. �5 (US$930) RL505. Rich Italian style (Hand). White, Green, Purple, Red. RL005. Quality damask, cross orphrey. White, Gold, Green, Purple, Red, Rose, Black. From from �5 (US$1,140) RL258. Wheat & Grapes (Cross shaped panel). White, Gold, Green, Purple, Red, Rose, Black. �5 (US$850) Other White embroidered Low Mass Sets. RL006. Gold cross Brocade. White, Gold, Green, Purple, Red. �5 (US$810) RL259. Ecce Homo: Needlepoint. White, Green, Purple, Red. Marian embroidered Low Mass Sets. RL262. Our Lady & Child. RL263. Gold & Flowers. White, Green, Purple, Red, Rose, Black. RL265. Rich Italian Style (Machine). Gold, White, Green, Purple, Red. RL267. Benedictus. White, Green, Purple, Red. RL270. French style gold machine embroidered. White, Green, Purple, Red.